The next in the series of tropical waves has become tropical depression 9 of the Atlantic hurricane season. Enough deep convection is present with a surface circulation at this time. As of Noon edt / ast the tropical disturbance was centered roughly near 12.4 N / 36.0 W or about 1700 miles east southeast from the Leewards. Top sustained winds are estimated at 30 mph (NHC 35 mph 11 am advisory). Movement is west 15 mph Pressure estimated at 1006 mb. Interests in the Lesser Antilles should monitor this system. Forecasts generally take TD 9 west over the next few days before moving more west northwest. They do not strengthen it much at this time. Tropical storm Gaston has formed. Deep convection has slowly built west and over the center of circulation today allowing TD 9 to reach tropical storm strength. As of 5 pm edt / ast the tropical disturbance was centered roughly near 12.9 N / 37.0 W or about 1635 miles east southeast from the Leewards. Top sustained winds are estimated at 40 mph (NHC 40 mph 5 pm advisory). Movement is west 15 mph Pressure estimated at 1005 mb. Forecasts generally take Gaston west over the next few days before moving more west northwest. They do not strengthen it much at this time. We'll cautiously watch this since Gaston seems to be strengthening "above the curve" at this time. In step with recent tropical cyclones in this area. 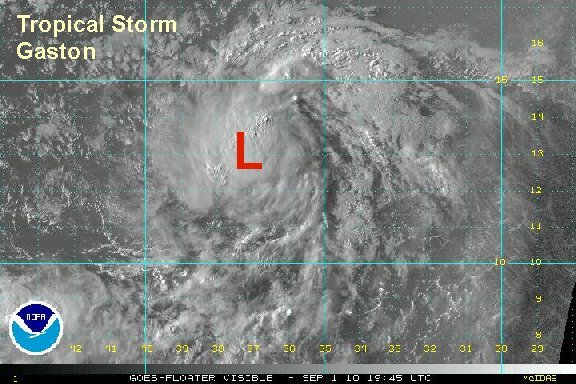 Gaston is not strengthening...yet. There is still minimal convection mostly on the west side of the circulation. There is plenty of time to keep tabs on Gaston. As of 7 am edt / ast the tropical storm Gaston was centered near 13.5 N / 38.3 W or about 1525 miles east southeast from the Leewards. Top sustained winds are estimated at 40 mph (NHC 40 mph 5 am advisory). Movement is west 9 mph Pressure estimated at 1005 mb. Forecasts generally take Gaston west over the next few days before moving more west northwest. Gaston is now predicted to be a hurricane in a few days. IF it affects the Lesser Antilles it would be in the early to middle of next week. No other way of putting it. 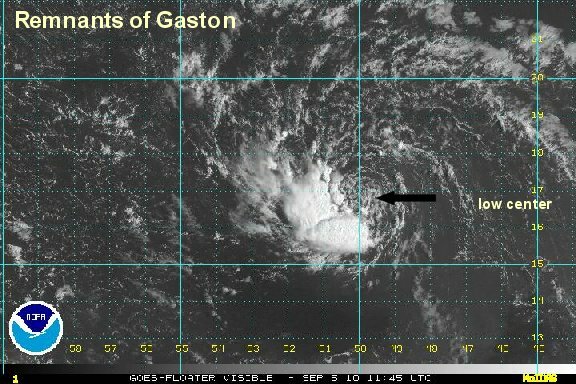 Gaston is drifting at this time with a few vorticies rotating about a center. Overall, not well defined. We completely agree with the national hurricane center that it is back to tropical depression strength. As of 1 pm edt / ast the tropical storm Gaston was centered near 14.3 N / 39.1 W or a little less than 1500 miles east southeast from the Leewards. Top sustained winds are estimated at 30 mph (NHC 35 mph 11 am advisory). Movement is erractic. Pressure estimated at 1008 mb. Forecasts generally take Gaston west over the next few days before moving more west northwest. Gaston is still predicted to be a hurricane in a few days. IF it affects the Lesser Antilles it would be in the early to middle of next week. The models are having an unusually hard time so far with the strength of Gaston. Be ready for anything. The hurricane center also knowledeged the sorry shape that Gaston was in. It is now a broad low with little convection. Be ready for anything was our comment from earlier today. 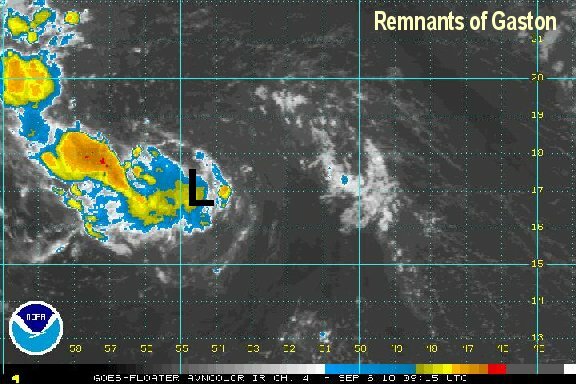 The forecast has changed from possibly becoming a hurricane to now a remnant low. As of 7 pm edt / ast the tropical storm Gaston was centered near 13.5 N / 40.0 W or bout 1450 miles east southeast from the Leewards. Top sustained winds are estimated at 30 mph (NHC 30 mph 5 pm advisory). Movement is barely west at 5 mph. Pressure estimated at 1009 mb. This will be our last update unless regeneration occurs. A low level circulation is evident again with the remnants of Gaston as well as deep convection. It looks like the deep convection is waning over the past couple of hours. If the convection disipates, Gaston's comback will be very short lived. If the convection holds on the hurricane center will reclassify. Right now, Gaston is not much to be concerned about. 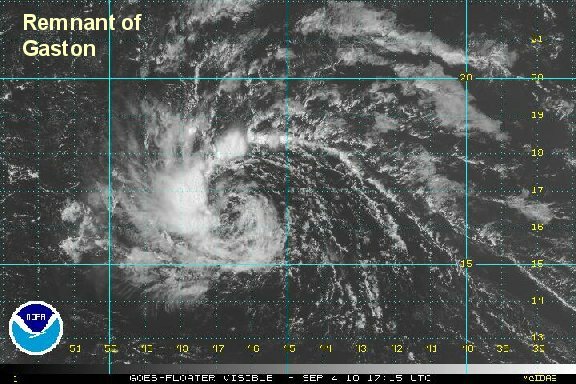 As of 8 am edt / ast unofficial tropical depression Gaston was centered near 16.0 N / 46.0 W or a little over 1000 miles east southeast from the Leewards. Top sustained winds are estimated at 30 mph . Movement is west at 6 mph. Pressure estimated at 1007 mb. 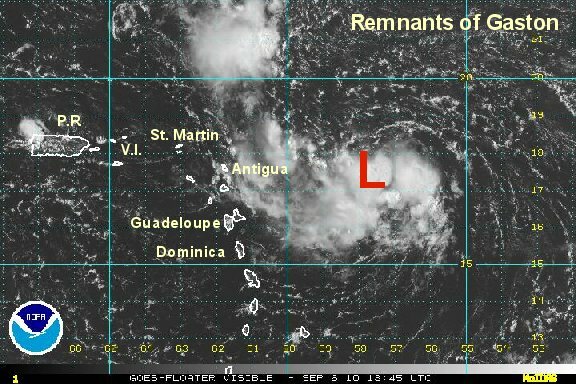 The remnants of Gaston did indeed lose most of its convection. It probably could have been classified as a depression for several hours early today. Its still worth watching. As of 7 pm edt / ast remnants of Gaston were centered near 16.8 N / 47.2 W or a little over 945 miles east of the Leewards. Top sustained winds are estimated at 25 mph . Movement is west at about 10 mph. Pressure estimated at 1007 mb. The satellite image is from a little earlier just before sunset. The remnants of Gaston are in a similar circumstance as yesterday. Convection has built up on the west side of the circulation. Once again there is probably enough there to classify this as a tropical depression, but no sense of doing it yet. The hurricane center made the right call yesterday by not reclassifying it yet. There neesd to be more continuity with Gaston's convection. As of 8 am edt / ast remnants of Gaston were centered near 16.8 N / 50.2 W or about over 750 miles east of the Leewards. Top sustained winds are estimated at 30 mph . Movement is west at about 9 mph. Pressure estimated at 1007 mb. Interests in the Leewards and northern Caribbean should follow the progress of Gaston. Gaston is forecast is be near the Leewards overnight Monday night / Tuesday morning, then move just south of the northern Antilles in to the northern Caribbean. A research aircraft found dry air near Gaston which has been apparently inhibiting its growth. Recent satellite imagery shows that convection is growning near the low center. 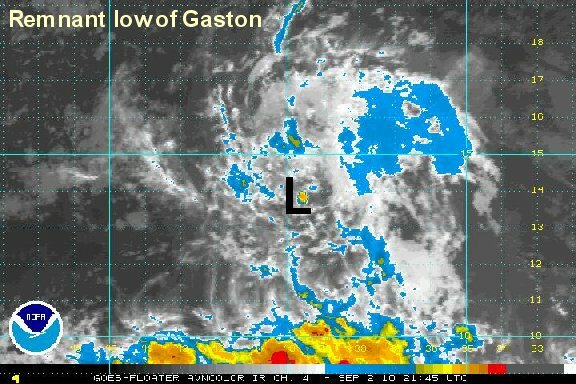 Enough is present to reclassify Gaston as a tropical depression. 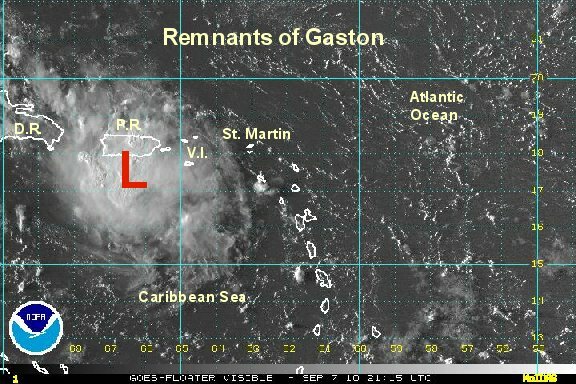 As of 8 pm edt / ast remnants of Gaston were centered near 16.6 N / 52.5 W or about 600 miles east southeast of the Leewards. Top sustained winds are estimated at 30 mph . Movement is west at about 9 mph. Pressure estimated at 1007 mb. Interests in the Leewards, northern Windwards, and northern Caribbean should follow the progress of Gaston. The remnants of Gaston have changed little. There seems to be just enough convection and circulation to label it a tropical depression. 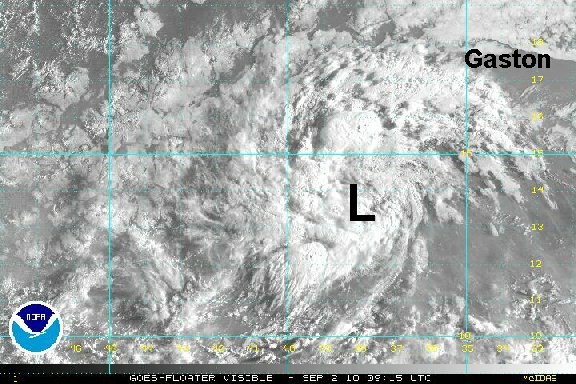 As of 7 am edt / ast remnants of Gaston were centered near 17.0 N / 54.5 W or about 460 miles east of the Leewards. Top sustained winds are estimated at 30 mph . Movement is west at about 12 mph. Pressure estimated at 1006 mb. The remnants of Gaston has gained a little organization and a little convection today. It is still estimated tropical depression status. 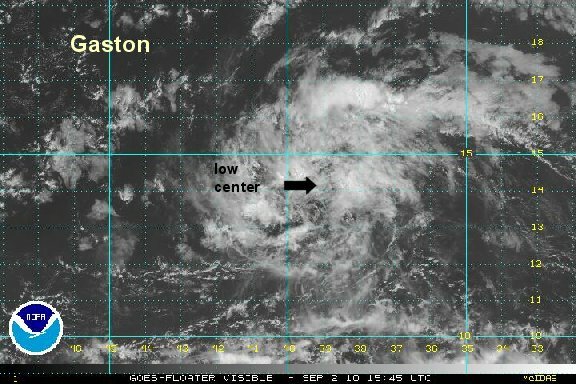 As of 4 pm edt / ast remnants of Gaston were centered near 17.5 N / 57.5 W or about 285 miles east of Antigua. Top sustained winds are estimated at 30 mph . Movement is west northwest at about 12 mph. Pressure estimated at 1005 mb. Interests in the Leewards, and northern Caribbean should follow the progress of Gaston. Gaston is forecast is be near the Leewards overnight tonight / tomorrow morning, then move just south of the northern Antilles in to the northern Caribbean. 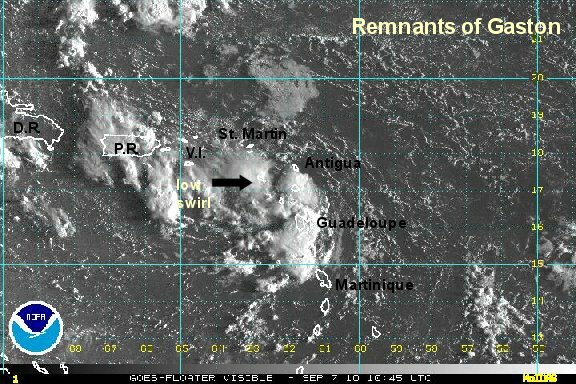 Convection is still associated with the remnants of Gaston. 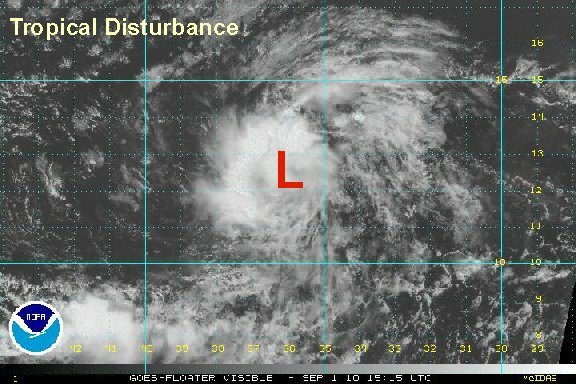 It appears that the low level circulation is not a well defined and is below tropical depression status. If a tropical disturbance enters the Caribbean with little development, there is little chance that it will develop until at least the western Caribbean. The northern Antilles will see an increase of showers and storms as the remenants of Gaston move by durng ht next couple of days. 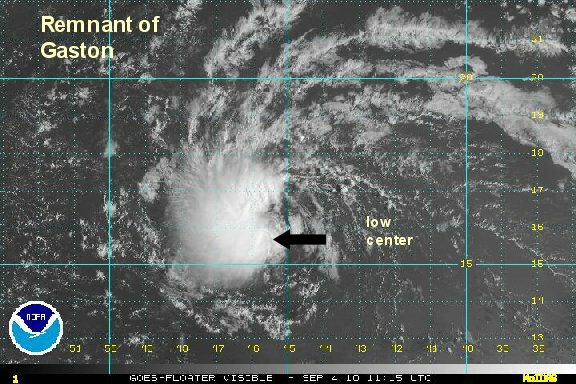 As of 8 am edt / ast remnants of Gaston were centered near 17.5 N / 62.8 W or near St. Eustatious. Top sustained winds are estimated at 25 mph . Movement is west at about 20 mph. Pressure estimated at 1011 mb. 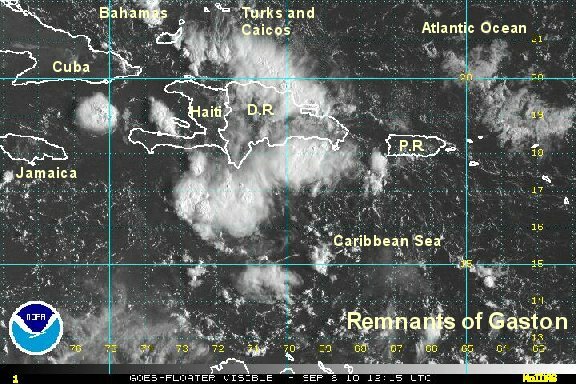 Interests in the northern Caribbean should follow the progress of the remnants of Gaston. The remnants of Gaston are forecast to move across the northern Caribbean the next few days. The remnants of Gaston are looking rather impressive. It is extremely rare for a tropical cyclone to develop in the eastern or central Caribbean if it hasn't already organized east of the Lesser Antilles first. This rule is only for tropical cyclones moving east to west toward the Caribbean. Anyhow, enough about weather philosophy. Showers and storms are moving across Puerto Rico and will be heading into the Dominican Republic soon. As of 6 pm edt / ast remnants of Gaston were centered near 17.5 N / 66.3 W or about 35 miles south southeast of Ponce, Puerto Rico. Top sustained winds are estimated at 30 mph . Movement is west at about 23 mph. Pressure estimated at 1010 mb. Interests in the northern and western Caribbean should follow the progress of the remnants of Gaston. The remnants of Gaston are forecast to move across the northern Caribbean into Wednesday and head in the direction of Honduras by later this week. The remnants of Gaston are now off of the southwestern coast of the Dominican Republic. Some deep convection remains, but the surface circulation is still very weak. As of 9 am edt / ast remnants of Gaston were centered near 17.0 N / 71.0 W or about 40 miles south of the southwestern coast of the Dominican Republic. Top sustained winds are estimated at 25 mph . Movement is west at about 20 mph. Pressure estimated at 1012 mb. Interests in the western Caribbean should follow the remnants of Gaston. The remnants of Gaston are forecast to move across the northern Caribbean though today and head in the direction of Honduras / Belize by later this week. 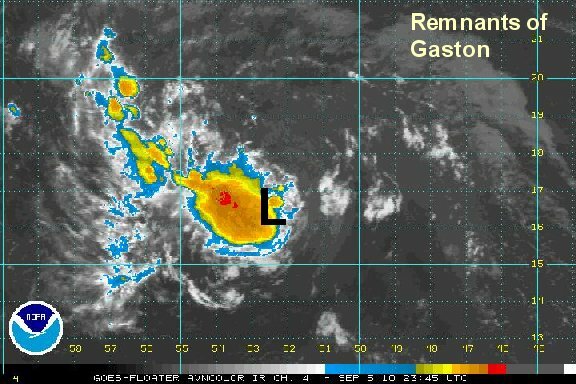 The remnants of Gaston are becoming diffuse and will not be tracked any longer. This will be the last update on Gaston unless regeneration occurs.